Dems Are Winning the Suburbs. Are They Losing Small Towns? 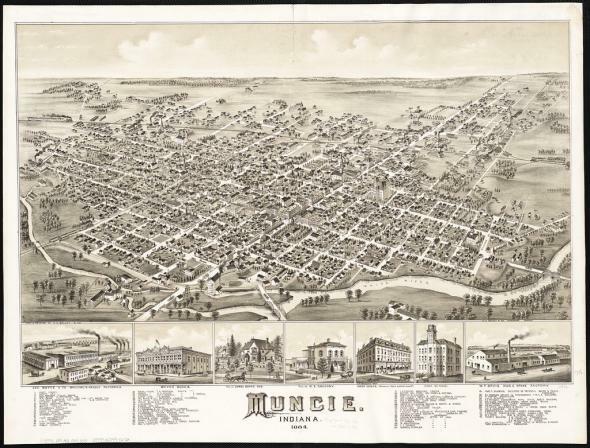 Voters closer to the center of Muncie, Indiana, shown here in 1884, are more likely to vote Democratic than their counterparts outside of town. Urbanites vote Democratic, and it sometimes seems like they always have. Republicans left cities during the postwar suburban boom and dragged the party platform with them: Urban reform gave way to racial fearmongering and crude stereotypes that have long outlasted any basis in reality. Donald Trump, who lies to his supporters in claiming that the murder rate is at a 45-year high, may represent the culmination of a GOP movement to see its urban policy—to the extent such a thing exists—as a racially charged pitch to suburban and rural voters. The extinction of the big-city Republican has been underway for a few decades now, but a New York Times analysis of voting patterns by population density reveals the stark shift in the voter booth. Population density is now highly correlated with Democratic votes. In 2012, only one county with a population density of more than 1,000 persons per square mile—a low bar that includes many, many suburbs—voted for Mitt Romney. That was Orange County, that conservative bastion of Southern California (and President Obama still hit 45 percent there). The rest, cities and suburbs alike, all went blue. The urban Democrat is everywhere now, but that link between geography and politics is relatively new: No such correlation between party and settlement patterns existed in the 1950s. A metropolitan political party has emerged. Beginning with Bill Clinton, the Democrats assembled a coalition that has captured large swaths of the suburbs. Colorado is one of the clearest examples: Over the past 30 years, a blue lake of Dem counties has swelled in the Front Range around Denver. The same has happened in Northern Virginia. It’s partly thanks to Dems’ centrist economic policies, which appeal to suburbanites. It’s partly because of demographic change: A majority of blacks and Hispanics now live in the suburbs, and suburban America fell from 81 percent white in 1990 to 65 percent white in 2010. And it’s partly because the Republican Party has grown more extreme in its positions on virtually every issue, ceding suburban moderates to Democrats. People who live closer together tend to be more Democratic at the local level, too, according to an intriguing analysis by Jonathan Rodden, a professor of political science at Stanford. 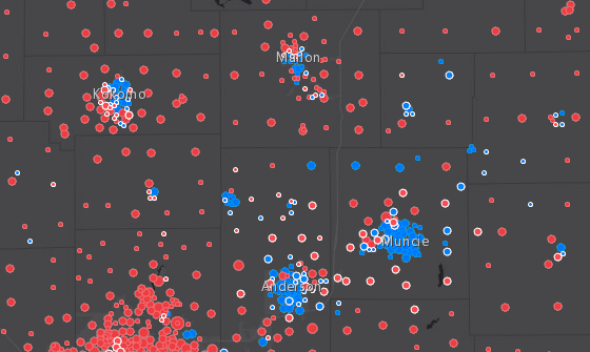 His 2008 Election Atlas of precinct-level voting results shows a pattern of lingering Democratic votes in red, non-metropolitan counties in Midwestern states. Rodden’s analysis shows that those fat red, rural counties that make up the geographic bulk of the Rust Belt on election night actually display regular internal patterns around their small, urban centers. In hundreds of small cities and towns in Indiana, Pennsylvania, Illinois, Michigan and Ohio, Rodden shows, the Democratic vote clusters within one mile of city hall, and decreases as you move out past the last stop sign. A 2008 map of blue towns and red country north of the Indianapolis suburbs. The electoral geography of the Midwest appears in fractals, where well-known city-suburb doughnuts are replicated at the local level. But this election, there’s evidence that demographic change in such places, far from breeding tolerance, is correlated with support for Donald Trump. That’s the conclusion reporters from the Wall Street Journal came to after running U.S. counties through the diversity index, which measures the chance that two people in a county will be of a different race or ethnicity. Trump won about 71 percent of counties nationwide—but he won 80 percent of counties where the diversity index had increased by more than 150 percent. Many of those counties are Midwestern towns whose fading fortunes have been turned around by large influxes of Hispanic immigrants. Their unemployment rate is often lower than in the country at large. Their residents have traditionally voted Democratic. But anti-immigrant sentiment is growing: In 39 Iowa counties where the index doubled, Republican registration has more than twice outstripped Democratic registration. (Many of the immigrants are not citizens.) The fear of immigrants, in other words, may be overwhelming the big-D Democratic sympathies that have long pervaded small towns in the Midwest. The two classes of counties are not necessarily the same. Rodden looks primarily at the post-industrial towns around the Great Lakes, while the Journal finds big diversity increases are concentrated further west, in Wisconsin, Iowa, and into the Great Plains states. What they have in common are longtime Democrats who, whatever their neighborly values, feel alienated by the party’s metropolitan shift, and see—however improbably—a populist in the real estate tycoon from New York City.